NATO forces are preparing themselves for Cold Response 2012 – military games with up to 16 thousand troops as well as fighting ships and aircraft from Great Britain, Denmark, Canada, Netherlands, Norway, France, Sweden and the USA to take part. NATO countries and neutral Sweden cooperate in the Polar region in the light of Russia’s increasing activities. The format of the NATO-Sweden exercises proves once more that the Arctic is perhaps the only region where the political alignment hasn’t changed since the Cold War, i.e., Russia is opposing other countries. NATO war exercises will take place between the 12th and the 21st of March aiming at promoting cooperation between the navy, the air force, special mission units and marines under Arctic conditions. According to official reports, the focus is on practicing actions combining diplomatic overtures with a military response in relation to the high risk of a conflict. Another aim of the exercises is to establish military cooperation between different countries. The exercises have been prepared for many months. Helicopter carrier Illustrious of the British Navy left Portsmouth last week taking course towards the area of the exercises. It carries a company of the 42 Commando Royal Marines, Sea King and Lynx naval helicopters, and Apache military helicopters. NATO’s activities will not be limited to the exercises in Norwegian waters. The Arctic Ram manoeuvres will take place in the Canadian Arctic from February 14th to the 26th even before Cold Response 2012 starts. According to the Canadian Ministry of Defence, the purpose of the exercises is to adapt military personnel to handling operations in the North, as well as to testing the capabilities of the 1st Canadian Mechanized Brigade to operate in winter conditions. The number of NATO’s manoeuvres in the region cannot be called a mere coincidence, especially taking into account the renewal of Russia’s activities in the region. New warships laid on the Northern Shipyard on the 1st of February are the first bricks in the renovation of the Northern Fleet. According to available information, two other Mistral class universal landing craft will fly to the North after they are constructed under French license. Russia is intending to increase its forces in the North, refitting old submarines and building new ones. 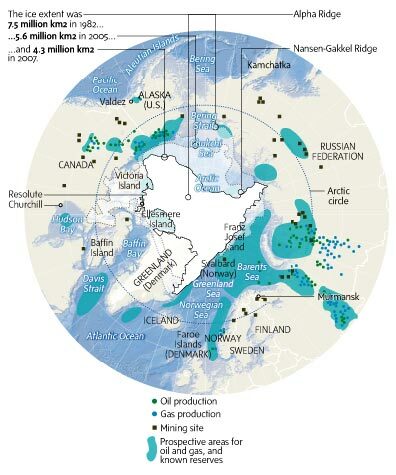 Moreover, Russian business and state structures are increasing economic activity in the Arctic. Today there are several programs dedicated to the restoration of the infrastructure in the region, increase of mining operations, and trade ship and icebreaker renewal. The key resource of the Arctic is the Northern Sea Route, the shortest route between West European and East Asian ports. The constant melting of the Polar ice cap results in the greater openness of the Northern Sea Route, which becomes more attractive for ship owners. Under existing conditions, the Arctic becomes a nexus between the two hemispheres, helping significantly reduce transport costs. Here the interests of the Arctic nations and China, Japan, India and South Korea, located in the south, intersect. For Russia the Arctic is the key to possible future well-being. The incomings from the Northern Sea Route, foreign ships staying in Russian ports, icebreakers’ work and finally the output of raw materials can bring huge profits to the country, provided there is competent management. Nonetheless, one shouldn’t rule out the possibility of the collision of Russian and NATO’s interests in the Arctic, as many territorial problems still remain unsolved and the military significance of the region is inestimable. Russia needs increasing military presence in the Arctic. On the one hand, to be capable of military response to any violation of its interests; on the other hand, to have a wide range of ways to react. Otherwise, even small conflicts like another dispute over fish landings, will make Russia concede. After all, it’s not a case where nuclear threats would work.